In need to de-stress and unwind? Looking for a relaxing reflexology treatment in the comfort of your own home with no need to get in a car or travel afterwards? I can offer just that. Whether you are looking to have a course of treatments, regular appointments or occasional visits, I offer quality reflexology treatments. As a mobile reflexologist I am able to travel to Saffron Walden, Halstead, Haverhill and neighbouring villages. Reflexology is an incredibly soothing and relaxing treatment. It helps to boost well-being, release tension, improve mood and sleep. It gives you the opportunity to allow the body and mind to reset. My name is Catherine Wainman and I set up Pear Tree Reflexology, naming the business after a beautiful pear tree in our garden. 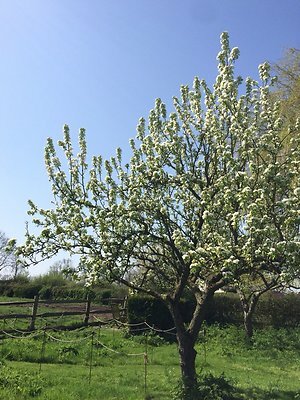 I love witnessing the tree's gorgeous blossom in the spring and munching on the sumptuous pears in the autumn. I am City & Guilds Level 3 qualified, fully insured reflexologist passionate about offering clients a relaxing treatment whereby you maximise on "me time". I have attended Dr Carol Samuel's course on Pain Management, an introduction to Nerve Reflexology which was a combination of theory and practice for supporting clients who may present with low back or neck pain. This gave me an opportunity to learn about the nerve reflex points in conjunction with neuro-anatomy and physiology with respect to pain. If you have pain in the low back or neck areas then do get in contact to find out how it works and how I might help you. Pear Tree Reflexology is also on Facebook - @peartreereflexology. Here you'll find information on offers and articles relating to well-being. Please feel free to like and share when you visit. 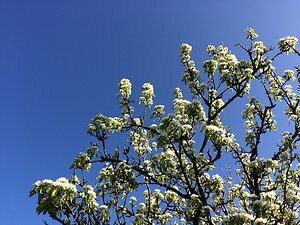 The pear tree in spring. Mobile service covering North Essex, including Saffron Walden, Newport, Halstead, Great Dunmow, Braintree and surrounding villages.